The Mt. Baker-Snoqualme National Forest in conjunction with the Mountains-to-Sound Greenway Trust is pleased to announce a major new recreational program for the Middle Fork Snoqualmie River Area. 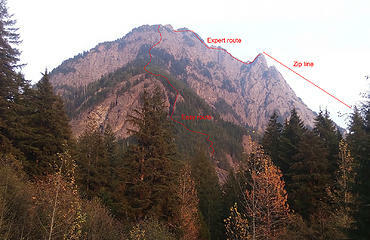 The plan will involve the construction of a “Via Ferrata” up Garfield Peak and the installation of two zip lines connecting the west summit of Garfield and the Middle Fork Trailhead parking lot. 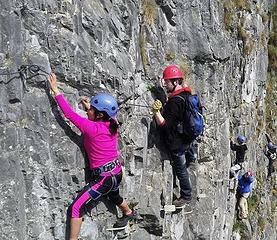 A “Via Ferrata” (Italian for “Iron Path) is a system of steel steps, ladders, pins, and cables that allow unskilled hikers to travel through steep terrain that would normally be the province of skilled mountain climbers. They can have a range of difficulties, varying from easy routes that have abundant hardware to assist climbing, to expert routes that offer little aid other than the protective steel cable. 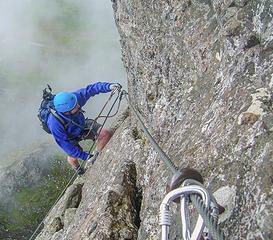 Via Ferrata routes have become immensely popular in the Alps and lately, in other mountainous areas in the world. 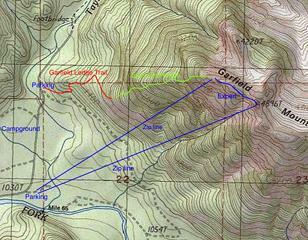 Mid Fork Via Ferrata: fun for the whole family! Ranger Eisenberg discussed his idea with the National Forest district management at a brew pub in Ballard, and after a few pints of IPA, everyone became excited over his Via Ferrata idea. They decided to apply for a grant from the Mountains-To-Sound Greenway Trust to fund its construction. Their outdoor-loving executives were equally enthusiastic, and the rest, as they say, was history! To save hikers from a tedious descent, two zip lines will be installed that connect the ends of the phase 1 and 2 Via Ferrata routes to the Middle Fork Trailhead parking lot. 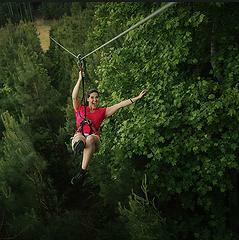 These zip lines will be some of the longest and fastest in the world. 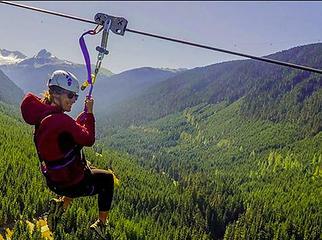 Depending on his or her aerodynamics, a zip line user will reach a speed of 100 mph or more, allow the 3800’ descent from the top of Garfield Mountain in a matter of seconds. Carefully engineered foam block piles at the lower ends of the zip lines will allow a safe and gentle landing. This picture perfectly shows what the gleeful and thrilled expression of a zip line user will be when she approaches the foam block landing spot at 100 mph! Construction of the Garfield Peak Via Ferrata and zip lines will begin in Fall 2019 and is expected to be completed in the summer of 2020. Great plan to announce on 4/1. It will open on February 30th, 2020. Comin' down that zip is considered cheating!!! That doesn't fly in circles I run with!!!! Anyone who does that is weak!! LOL! Ya, that would work really well in sue happy America. That will never happen. Can I give you a Sure Buddy? Surely more exciting developments will ensue. We need some accommodations to go with that. Hotel at the base? Expanding the hot spring? A railway up the Middlefork....anything else? Comin' down that zip is considered cheating!!! What a great posting on April Fools Day! There are a lot of hikes where I've whined about the lack of a zipline for the descent--since my bad right ankle is at its most painful on descents. I've never tried a zipline but I've loved the via ferrata routes I've done, including the VF at Whistler. When I heard rumors of this, they were mentioning a water slide off the north face of Garfield and down into the plunge pool of Otter Falls. Are they still considering this? I knew there must be some way to make money off that big hunk of rock. This is a great idea! To round it out for multiple use, please make the entire route a non leash area for our doggie friends, and include a shooting range near the parking lot. include a shooting range near the parking lot. well if there's going to be a 100mph zip-line, may as well put the shooting range IN the parking lot. There's really not that many places to practice fast draws from the gun rack. This could be it. Funny you mentioned money. Due to the miserable experience caused by the current Enchantments permit system, the Forest Service is going to try something new for the Via Ferrata and zip line time slots. They will simply put them on EBay. May the highest bidder win! Not a bad idea for the 'chants permits. Get a biddin' war goin'. For an extra couple hundo it comes with liability insurance and discounted SAR rates!